She is now 8 so she’s being going a long time. 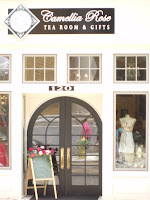 Our favorite place is Camilla Rose in Plant City, FL. She felt so special! She loves to look at her place card/marker with her name on it too. I hope they never discontinue that. All the girls love it and look forward to seeing their name. One of their “signature” features also is the rose napkin at our place setting. I taught Mackenzie how to make her own last year. She’s been turning everything into roses. I think even her bed sheet! Yep! A big girl. She pours her own tea. What little girl can resist going for the gummy bears first? Look at the cute smiley face PB&J sandwich on the bottom tray. I order the special little girls tea for them. Camilla Rose always asks if there is anything the child does not like so they can tailor it to their tastes. I like that. You sneak ‘em whenever and wherever ya can! This was my food. If they ever take away the chicken salad sandwich (pictured on the second tier, way in the back), I’ll be a very, very sad lady! It’s so incredibly gooooood!!! So on the last picture of the day, I get this. I guess all us “big girls”, get a little crazy now and then, right? The next Tea is with her sister, Mackayley and this was her first tea! Stay tuned! What a wonderful idea, 'Nette! It makes me wish that I lived closer to our young granddaughters so that I could do the same thing with them. I'm going to look into the Tea Room and see if I can't arrange to take both of them (and their mommy) there when they come for the Christmas holiday this year. I really enjoyed the photos of Mackenzie. She was a perfect little lady. Some day she'll be glad you took all those photos! Hey there my sweet friend! Oh, yes! You should totally do it. They are so sweet at Camilla Rose. It's a little drive, but you could visit some antique shops while there....and don't forget to visit Southern Hospitality!!! That looks like a lot of fun. I will share it with my daughter, who lives closer. I live in Florida, too!